PortAventura has been one of Spain's many notable tourist attractions since it's inception in 1995, and has grown vastly over the years from an independent project to an expansive resort under the ownership of Uniseral Sudios. With an annual attendance of around 4 million, it's by far the most visited theme park in the country, and one of the most popular in all of Europe. Known as The Secret of Maya in English, this attraction is one that not many people will be overly interested in, but I myself was surprisingly hooked by it. The main goal is to enter the small building and find the exit, however one thing stands in your way: mirrors. The interior is littered with mirrors that, alongside clever lighting and visual effects, make finding the correct route a frightening and tricky task. The optical illusions make for a lot of mindfuck moments and definitely evoke a vibe of some sort of horror set piece. Again, not one of the park's biggest attractions, but I certainly loved it. El Diablo (The Devil in English) is an old school mine train roller coaster that opened in 1997. The ride appeals to all manner of age groups, but never restrains from providing intense thrills; riders endure all manner of sharp turns and sudden drops as the train speeds around at nearly 40 miles per hour. Lasting just over two minutes, El Diablo is also one of PortAventura's longest rides; and never gets boring, that's for sure. Going into a lot of detail is difficult as it's not as innovative in today's world, but that doesn't detract from the fun factor whatsoever. Furius Baco is the fastest roller coaster in Europe, launching at 84 miles per hour into a brief circuit filled with sharp turns, concluding with a twist inversion and a steep turn that shoots past the nearby lake. It's less than a minute long, and it's queues can become pretty hectic on busy days, but this is still a must for any fan of roller coasters. The bumpiness the trains endure around the circuit can make the ride a little jolting, but to me it was somewhat effective at complimenting the already chaotic sense of speed. Short lived, but still awesome. Dragon Kahn pre-2012, before Shambhala was built alongside it. Dragon Kahn has been part of PortAventura since it opened in 1995, and is a classic Bolliger & Mallibard roller coaster appealing to the slightly older crowd, or kids who just aren't as sissy as me when I was younger. It features eight inversions, the most of any B&M roller coaster, including a standard vertical loop, corkscrews, a cobra roll, and a zero-G roll. It's a standard thrill ride that keeps you disoriented in the best possible way. 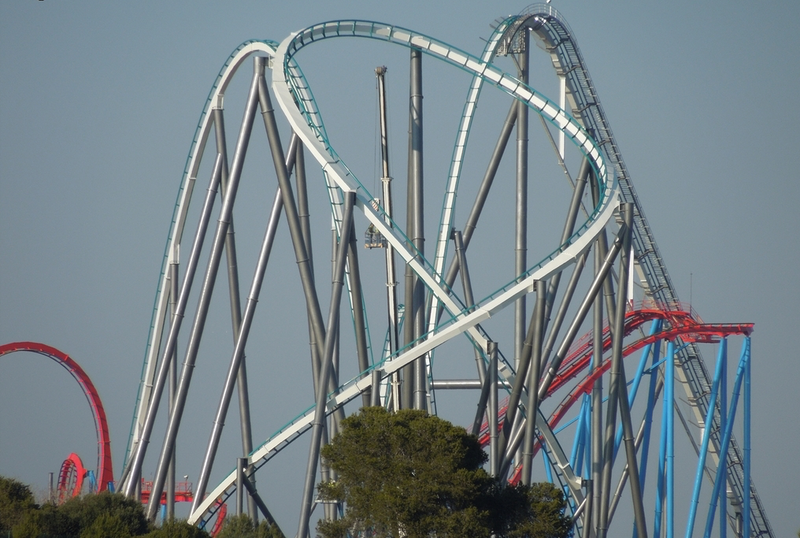 What's even better is that it now intertwines with the most recent Shambhala coaster, making for an incredibly unique and surprising experience when both of them launch simultaneously. Opening to the public in May 2012, Shambhala earned milestones as the fastest and tallest hypercoaster in Europe, peaking at 78 meters and reaching a top speed of 83 miles per hour. The trains themselves expose riders to the height and speed without mercy; they're completely flat, with no small barrier on either side of your feet. On top of that, you're only strapped in with a thick lap bar instead of an over the shoulder harness. After slowly climbing the 78 meter high lift hill, riders immediately swoop down at top speed and face all sorts of steep turns, twists, and sudden drops; including camelback hills, a splashdown, and a unique inclined figure eight element (seen above). You'll experience nearly 4 times the force of gravity during the trip - this combined with the immense pace of the train makes for one of the best roller coaster experiences I've ever undertaken. It alone makes a visit to PortAventura worthwhile. Interestingly, the trains have on board cameras which allow you to purchase a video of yourself being filmed during the ride, which can be bought as a DVD or a digital file on a USB stick. So, here's my one. Enjoy.